At last peaches and nectarines are reaching their best. The flat varieties I've been buying are particularly good this year. Now they've been joined by the French Pêche de Vigne, or Blood Peach. Planted in vineyards as a fragile counterpart to the tough grapevine, it provides an early indication of disease attacking the vines. 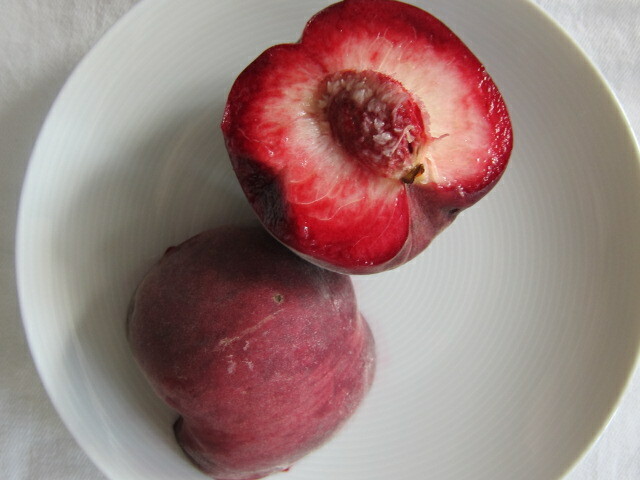 The familiar peachiness is sharpened by a red-fruit tang similar to that in blood oranges. Some of these dusky-skinned peaches find their way across the channel but you've probably only got a couple of weeks to get your hands on them. This beauty came from Leila's Shop in Shoreditch along with some gorgeous black Muscat grapes, but ask your greengrocer about the special Pêche de Vigne .